Happy Saturday friends! 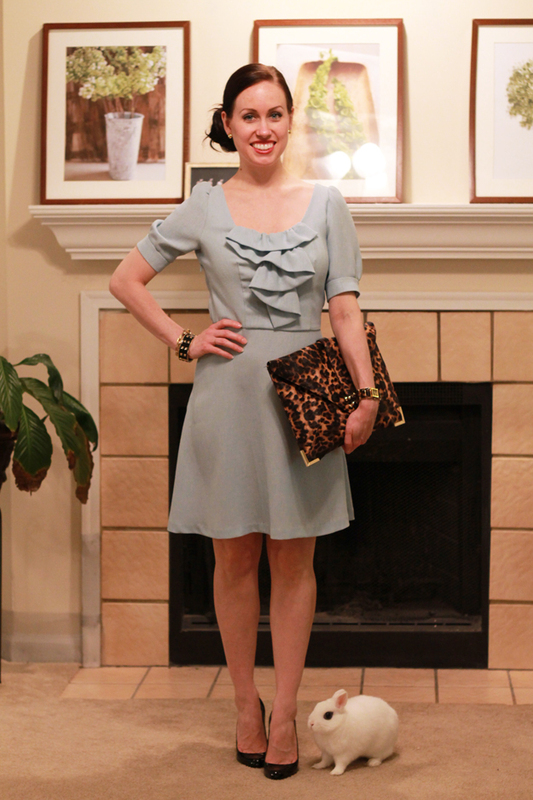 If this dress looks familiar, you may recognize the style from this post. I made it several years ago by combining three different patterns and redrafting a sleeve pattern. The fabric color is hard to capture on camera - it's a pretty light aqua and I corrected the last photo to show it more true to color. I found the fabric in the clearance bin for $4/yard. 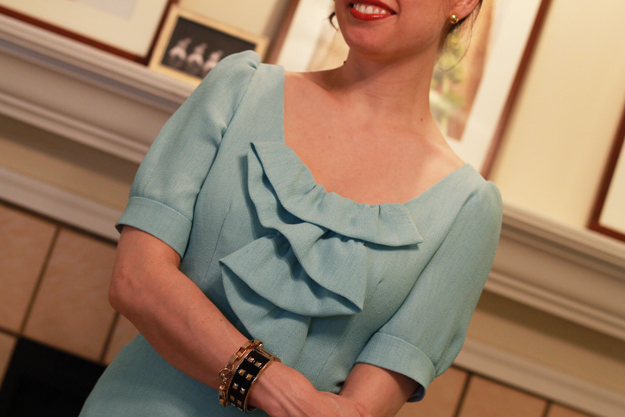 It's a fairly easy to make and wear dress, and lately I've been getting the itch to make more things! Thank you so much for visiting! PS - tomorrow is my birthday! Happy early birthday. Such a cute dress. That's a nice soft textured dress and you look gorgeous. Love that little white rabbit at your feet. Happy Birthday Mary Ann. May all your wishes be fulfilled and all your dreamz and dezires come true. 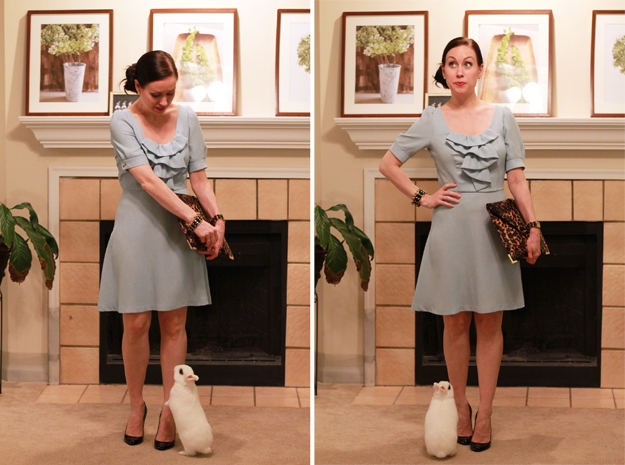 lovely dress,the rabbit is adorable!! HAPPY BIRTHDAY! !wish you all the best!! You are so great at making things! I love the ruffles on this dress. It's flirty and fun. P.s. that side bun is just fab. I've tried to perfect a side bun...but let's just say I have drastically failed! Such a cute dress...your skills never cease to amaze me! Happy birthday, you pretty girl! I hope it's a great one. Let me say that that bunny is totally precious. You guys look cute together. (; You made that dress? Wow, you're good. It's adorable. Your clutch is insanely wonderful. It's the ideal size, and looks fantastic! I hope your birthday is/was simply lovely. Your dress is so pretty. I love that bow and the great color! today is your day, so I wish you the happiest birthday ever, I don't know your exact age, but count for each year a big kiss from me! The dress is very pretty. Cannot believe you made it. You must be so talented. You made your own dress?? Wow, that's amazing! I am really impressed :) Hope you'll have a great birthday celebration and Happy Birthday! Mary Ann your bunny is just the most adorable accessory ever... so gorgeous!!! And I can't believe you made the dress, wow it's spectacular (love the silhouette)! I've seen enough... am now your newest follower! anyway Great blog im following you now. OMG that bunny! Too cute...goes really well with the dress! :) Just found your blog and love your style! Now following. I can't believe you made that dress! It's so girly I was hoping to find out where you got it from LOL! Really pretty dress and I hope you had a great birthday!!! Gorgeous clutch btw! Wow....Beautiful dress! Wish I had such sewing talents! Love your bunny....he is so so cute! Thank you for dropping by my blog and leaving such a sweet comment...sorry it took me so long to reply! Have a fabulous weekend!